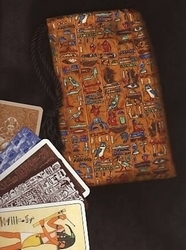 Small Tarot Bags - Hieroglyphs Small Tarot Bag - Tarot Bags, Tarot Cards, Cloths, & More! 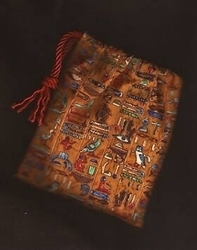 Numerous hieroglyphs, copied from the walls of ancient temples and tombs, form five columns of pictographic script on this dark gold cotton fabric. The background looks like roughly hewn stone walls and the symbols and figures include such objects as an all-seeing eye, vulture, owl, quail, reed, leg, arm-hand, servant, seated pharaoh, mouth, basket with handle, horned viper, water, tethering rope, etc. 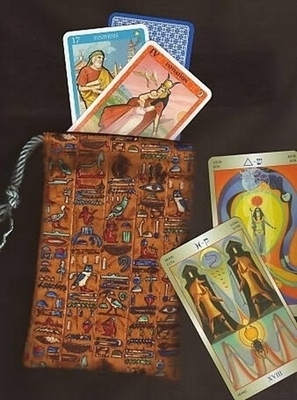 The small bag is shown here with cards from the Masters of Magic Oracle Cards and the Liber T Tarot. Either deck will fit in the bag. Color scheme: dark gold, brown, black, blue, red, aqua, and white. Size: Small, approx. 4-1/4 x 6-3/4 inches. This bag fits decks that are pocket-size and ones that are shorter and narrower than standard sized tarot decks.